Sports Hall Athletics County Finals! On Monday, our Sports Hall Athletics team headed off on the coach to Cheltenham Ladies College with great excitement as the children couldn’t wait to represent Stroud in the small schools group of the Level 3 county finals! The competition was tough and the children participated brilliantly. 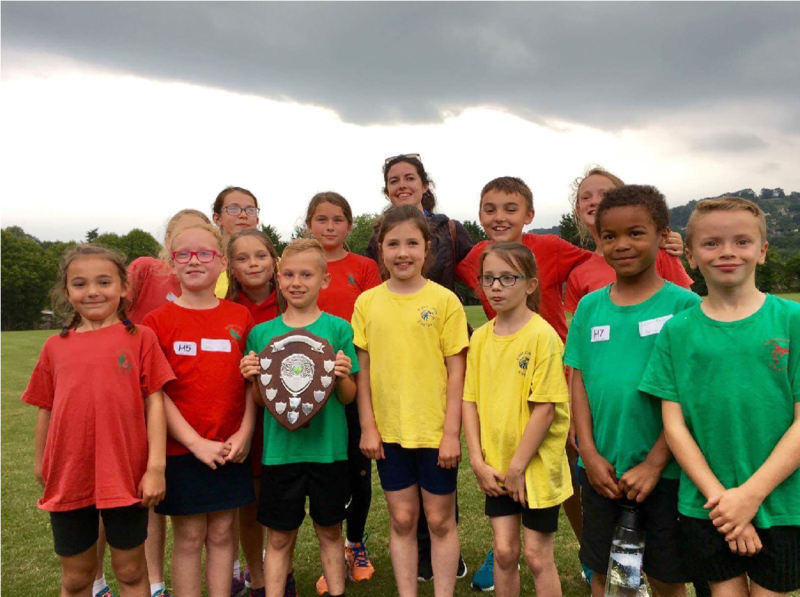 There was great excitement and enthusiasm when Bussage got to team up with Chalford Hill to represent Stroud against teams from Gloucester, Cheltenham, The Forest and the Cotswolds, in some mixed track events. Bussage did an outstanding job and finished in 2nd place overall! What a fantastic achievement for the school. A special thank you to all the support we received from parents! Our footballers had a great start to the new year when they took part in the Riddiford Shield at the start of January. They won all of their group games and went on to the finals where they were narrowly beaten by Minchinhampton, who went on to win the Riddiford Shield! They played with a fantastic spirit and were a credit to the school! Bussage had great success at their recent Sports Hall Athletics event. The children took part in a number of track and field events against other large and small schools from the district. Bussage finished in 1st place in the small schools group and are really looking forward to their trip to the county finals at Cheltenham Ladies College on 21st January 2019. Well done to all the amazing children who took part! Well done to our very talented Handball Team who took part in the Level 2 Handball Festival at Stratford Leisure Centre on Friday. The children took part in coaching activities and then played some mini games to put the techniques and game play into a match situation. The children really enjoyed the day and are looking forward to future Handball events! Our Y5/Y6 footballers attended their first Football tournament this week. They were competing against 16 other large schools in the District. Bussage finished in second place in their group stage which meant they then went through to the Challenge Cup where they played against other teams who had come 2nd in their groups as well. They played to a very high standard and finished in 1st place in the Challenge Cup! Well done too all! What a great start to our first District Sports event of the year! On Tuesday 25th September, 10 children from Bussage competed at their first Cross Country event this academic year. It was a fantastic event with 361 children taking part from schools in the district. Bussage did a fantastic job and Mrs Trim was delighted with all runners! A special mention to those who finished in the top 10 of their races. Eleanor (2nd place),Ollie (3rd place) and Noah (9th place). Looking forward to the next race in February! On Thursday Bussage competed in the Thomas Keble Mini Olympics 2018. They got to meet and chat with European 200m sprinting silver medalist, Elliot Powell, along with Charlotte Wingfield, 100m Olympic athlete who represented Malta in the Rio Olympics. They then participated in a number of events, including hockey, basketball, football and athletics. The afternoon was fast paced and all children put maximum effort into a thoroughly enjoyable afternoon. It was a fantastic event and Bussage had success with one of our teams taking 1st place! Well done to all involved! Well done to our fabulous, long jumpers, throwers and sprinters at last weeks and this week’s District Sports event at Stratford Court. 30 children took part in what was a very hot evening on the track this week. The children dug deep and sprinted as hard as they could. Even when batons were dropped they showed great determination and resilience and as result Bussage finished 2nd due to all of their hard work! Well done to all who ran, jumped or threw, over the last 2 weeks. Fantastic achievement for Bussage! More Great Results In The Year3/Year4 Cross Country Races! Our Year 3 / Year 4 children took part in the rescheduled races at Stratford Park on Monday afternoon and enjoyed much better running conditions! The following children took part : Eleanor Sheffield, Noah Martin, Jacob Collins, Laurence Rose, Max Nurding and Jake Shone. Eleanor Sheffield came in 1st place in the Year 3 girls race and Noah Martin came in 3rd place in the Year 3 boys race. A huge congratulation to all our runners! Great Results In The Year5/Year6 Cross Country Races! Our Year5/Year6 children recently took part in the cross country races at Stratford Park. The weather wasn’t the best but the children didn’t let that phase them. All of our runners did fantastic in their races with some great results from Henry Sheffield who came 1st in his Year 6 race and Liberty Ross who came 2nd in her Year 6 race! The top 10 children from each of the races qualified for the county races and this year we had 6 children from Bussage who qualified. Huge congratulations to Henry Sheffield, Zac Humphries, Liberty Ross, Meg Pacini, Oliver Fisher and Lourens Brand! Our Year 6 girls football team competed in the ‘Len Hutton Indoor Football Tournament’ at Brimscombe last week. They won their first five preliminary matches without conceding a goal which put them through to the quarter final. They won their quarter final match 1-0 but were finally defeated in the semi final. In the third place play off they won their match, which earned them a bronze medal! Congratulations to the team for a fantastic effort! Year 5 /Year 6 Tag Rugby. The team took part in their first tournament on the year and had a great experience playing against some fantastic teams from other schools in the district. The children really enjoyed chasing down the opposition for their tags and were ecstatic when they scored some brilliant tries! Well done to the team! Another year, another great start to the trophy cabinet! 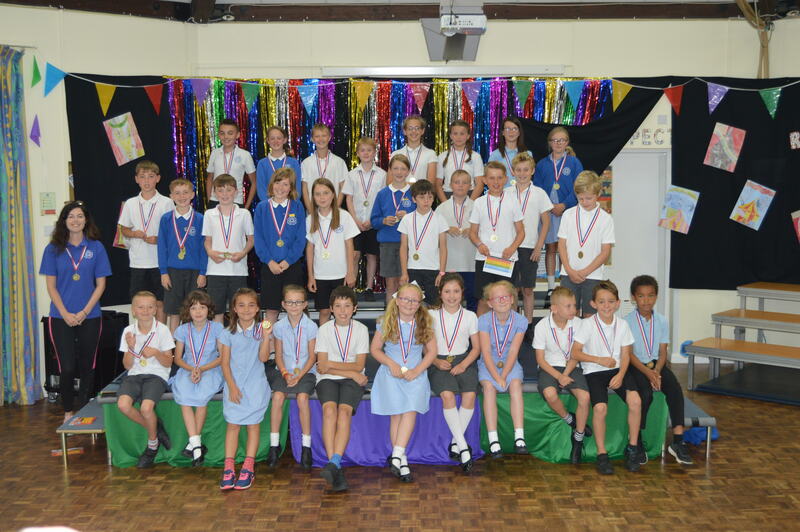 Our year 5/ year 6 athletics team have had great start to the new academic year. They took part in a Sports Hall Athletics competition and finished in second place! The children were delighted with their shiny silver medals! 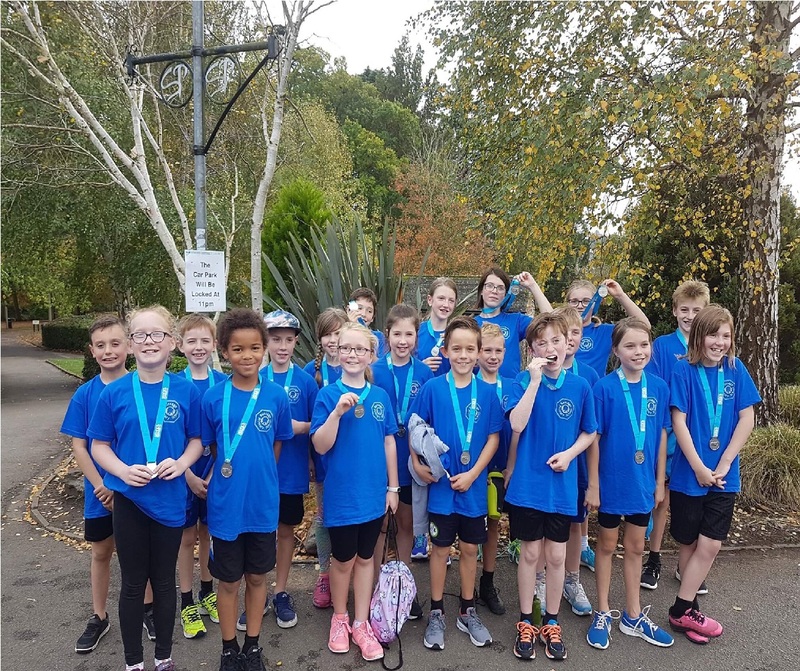 Our athletics team did themselves proud in the recent District Athletics tournament, where they came out on top as the overall winners of the tournament! What a fantastic achievement! At Bussage, we try to encourage as many children as possible to get involved in competition. There are two types of competition, intra and inter. Intra competition involves competing against others in school. We do this through an annual sports day, matches in PE and whole school events such as Spring Cup. Inter competition involves competing against other schools. Annually, we compete in netball, football, tag rugby, cross country and athletics which are run across Stroud District for KS2, and multi skills for KS1. We also arrange friendly matches against other schools in these sports.